I loved this little story, my son read it to me(9) and wow what a sweet idea. Everyone will encounter people who seem to blame the world for everything wrong and this story brings that across that it is not your fault...nothing is wrong with you...they just have forgotten how to love and especially themselves. I hope he understood the story...I did and I hope to use this in my next family home evening meeting. My 10th grader has a kid giving him a hard time...name calling, threatening to beat him I loved this little story, my son read it to me(9) and wow what a sweet idea. Everyone will encounter people who seem to blame the world for everything wrong and this story brings that across that it is not your fault...nothing is wrong with you...they just have forgotten how to love and especially themselves. I hope he understood the story...I did and I hope to use this in my next family home evening meeting. My 10th grader has a kid giving him a hard time...name calling, threatening to beat him up, etc, I pretty much told him this book and hope that he can understand that this kids problems have nothing to do with him. My son is not the problem this kids has problems way beyond him. Great book...loved it. I will give a review of this series on my blog soon. 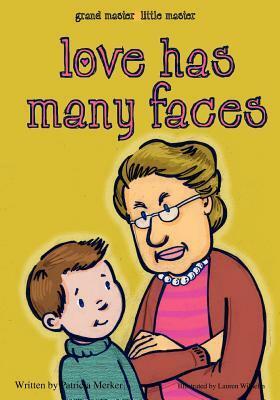 How do you teach a child that grumpy or "non-smiley" people can love and can still have loving care inside them? How is a child to find the love inside those around us? This book shares, through story, ways to make clear that love and care can look different in many kinds of people, and that people show caring in lots of differing forms. And the characters - student, teacher, parent, and friend - in this book beautifully and simply depict the concept: we all learn from one another. This helps children see that they are as valuable as any adult - as valuable as any person! Bravo author Patricia Merker. The story also features, as all the books in the Grand Master Little Master series, writing letters to clearly give readers options for dealing with life topics. Explaining daily life events, such as strong feelings and emotions, can be hard. Often words don't come easily. Yet reading this story, then taking time to choose feeling words and definitions for your child clarifies and paves the way to healthy adults, adults who know how to cope well with uneasy issues. Thank you, Patricia Merker, for your dedication to this precious and effective book series that embraces powerfully healthy ways to parent, grandparent and otherwise teach our children how to deal well with all kinds of people and topics in our daily lives. * Extra educational material to go beyond reading each book. * how to clearly address seemingly difficult, intense topics in all of our days lives. In addition and the icing-on-the-cake of this brand-new books series, author Patricia Merker weaves-in the spiritual, inner self aspect of life. You know, the intriguing unknown levels of the soul that none of us really know for certain, for sure; Ms. Merker weaves-in this life-level in a non-denominational, beyond religion universal story line. toward others. This should be required reading for 1st grade.